If you’ve been to New Zealand or Australia or are just a dessert lover, you’ve probably heard of the pavlova, a meringue based cake named after the Russian ballet dancer Anna Pavlova. 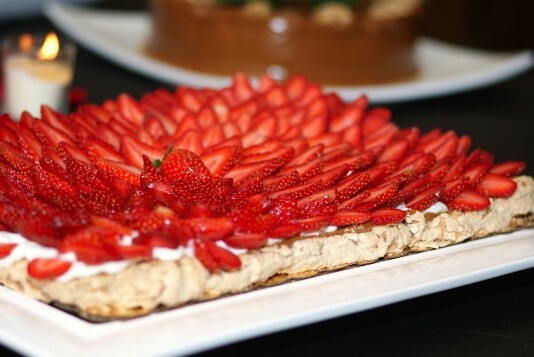 It’s such a popular dessert for special occasions that the culinary world in both countries is dueling to this day over the nationality of its creator. The Peruvian born Maria Luisa Benavides has taken the concept and transformed it into one of my favorite desserts of the year (here’s a list of my others). I had it recently at a friend’s house and a day later rushed over to the source, Piononos on Key Biscayne (T.786-488-6770). Would you believe they sell 300 of them for Thanksgiving! So what is this divine confection? It’s meringue with walnuts, much like a dacquoise, with a layer of dulce de leche, crème Chantilly and a choice of strawberries, mango, kiwi or mixed fruit. The combination of the light crunch of the meringue, the creamy texture of the fillings, sweetness of the dulce de leche, and the fruit flavor is heavenly. They come in a variety of sizes – for 8 people ($30), 15 ($55) or 30 ($100). Bite size and individual servings are offered as well. The strawberry pavlova is usually available, but it’s best to call and order in advance especially for the holidays. They also sell key lime tarts, chocolate cake, jelly rolls, a variety of mousses, and Peruvian desserts.Perfect for holiday dinner parties.